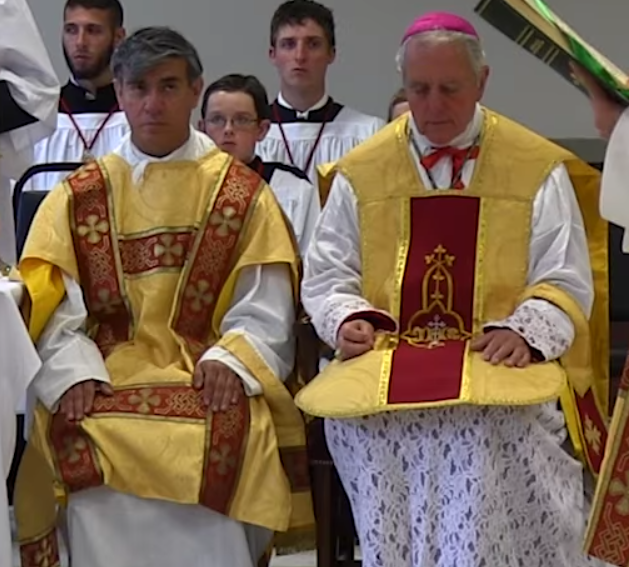 Question -can you elaborate on the straightjacketing of the FSSP? It seems to be the position of Bishop Williamson that the FSSP has ceased to (at least openly) oppose Dignitatis Humanae, as well as ecumenism and collegiality as stated in the Acts of the Second Vatican Council. He also took great umbrage when the Roman authorities removed Fr. Bisig. Bishop Fellay in 2002 ago had this to say about the Roman offer: "It is a wonderful Rolls Royce since we would have ordinary jurisdiction, but we are holding back because of the many nails on the road. Assisi, ecumenical pluralism, the demolition of the fundamentals of the Faith". HURRAH for Bishop Williamson!The SSPX Bishops are getting older, and it is necessary to have some younger Bishops to assure the survival of a valid priesthood. Although I've some disagreements with him, Bp. Williamson is a man of courage, a sincere and faithful Catholic. He needs to change the consecration date to a Sunday w/saints feast day. I can't believe he made the date on a simple feria day?!?! That is wrong and Bishop Williamson knows better!!!!! Maybe he forgot to check with his his mentor visionary to see what her apparition has to say. Williamson is a disobedient, uncharitable pot stirring rabble rouser. He has been trying to draw priests unto himself by planting suspicion and lies FOR YEARS. That according to his magic munchkin Allyson Anderson. The Devil loves this "Resistance Without a Cause". Even more that Williamson does. What a sad bunch. Where is the consecration going to take place in the US? He is not, he believes there are miricales in the new mass, he also tells the faithful it is ok to go to NO masses, sedivacatist masses as well as schismatic rights. His masses and sermons are "private" as well as the other bishops and priest under him! The mass is a public form of worship! He is a Masonic infiltrator and will lead the last of the sspx into destruction. He holds holy oils from any priests that dare speak out against him, bravo to those good and holy men! He is doing this on ferial weekday and its wrong!! Consecrations are to conferred on a Sunday,feast day of apostle or a Saint. Why he is on a simple ferial Thursday defies logic and Catholicism. "FSSP" was promised a Bishop with traditional ordination/consecration holy orders in 1988. 29 years later and they're still ordained by Novus Ordo anglican-esque "bishops"
In fact Fr.Bisig,a valid priest,was booted from command for frequently inquiring about this supposed Bishop. Who says the 'Conciliar Church' don't keep promises?!?! Robbie.... you are totally wrong. I have since learned Bishop Williamson uses the post 1962 calendar,not the pre-1950 calendar. On the catholic calendar pre-1950,May 11 is a ferial day. On the post 1962 calendar its a feast day. "St.Lawrence Press Ordo blog" is a great source of liturgical information and history.They have taught me a great deal. Moderated means CENSORED. The enemy censors. So we'll see if this gets posted or if this site is allied w/the false churches. SSPX is a false church(aside from a few good priests within that are trying to do the right thing in spite of all odds the devils within are throwing at them). We've witnessed SSPX committing these GROSS SACRILEGES. Catholics began leaving and Zendehas invited in jews and novus ordoites to replace us and disrupt. Freemason, Zendehas himself, commits a Gross Sacrilege at every mass, and as we watched(WITNESSED). He's still not a bishop of anything except hell. He refused to completely close in the Sanctuary with the communion rail, and the Churches are NOT Consecrated (they pretended using their fake bishop). He hid large statues and a HUGE and beautiful Crucifix, as well as the remaining Communion rails, in the basement of the Church. Which, we found. He had told me they didn't have any statues (obvious lie). He also hid the Holy Water that was blessed by a real priest, which we found under the counter in the sacristy. Fake brother joseph (likely a fallen angel shape shifter) would not let us have it to put into the tap water in the church fonts. He yelled at us at the top of his lungs, to not put it in the fonts and he followed us out of the sacristy to the back of the church still screaming at us. Frankly, we don't care. We know he was from hell, so we just let him yell. Most of the time the Holy Water fonts were empty, so as to get parishioners used to not having it. We were yelled at by 'brother Joseph' when we tried to retrieve this blessed Holy Water from under the cabinet in the sacristy. Zendehas went on to hide the leftover blessed holy water- a HUGE font filled that had been blessed and consecrated at one of the prior Easter Tridiium Ceremonies of the Church. Zendehas didn't want us using it. He yelled at me when I accused him of hiding it in alcove at the back of the Church where parishioners would forget about it and think it was empty. Fellay is an Anglican or Lutheran and went to a catholic Seminary for only 3 years or so, enough to play a convincing bishop of the catholic church. He's not. Williamson is not what you think either. He could be a shape shifting fallen angel as well. The only pretend-bishops he anoints, are agents of the devil. The few good priests within this society will never be made even fake bishops. If the good ones try to tell the truth to parishioners, they are exiled to another part of the country where only a foreign language is spoken....so they can't understand the priest. I know this for a fact, also. Nice. Huh? We were around SSPX during a lot of this. If you think SSPX and their fake bishops and mostly bad priests, are catholic and that you are getting the VALID Tridentine Mass., guess again. Believe Our Lady when she said the Church is in Eclipse (that means under the darkness of evil...under the darkness of the occult). It is the fakery of hell. There are no Churches for you to go to. Stay home and Pray. If you don't, they will have you believing the antichrist is Jesus (they will call him the messiah). Why? Because, I believe, they and the so-called Fatima Center are in existence to endorse the antichrist as the messiah (the false messiah), when the time comes. This is only my opinion, based on various instances and what I know about each of these organizations, personally. Keep to yourselves and pray the 5 decade rosary daily. That's all you can do. It will please & appease God. They keep the illusion of traditional churches to keep trads off Rome's back & so that at the appropriate time they can grab all traditional catholics in one place. Moderated means moderated, Anonymous 13:09. Glad that you have an opinion. Bishop Williamson is a good and holy man. So few know the true Faith. He is condemned for speaking the truth.that makes him someone to listen to when there are so few Bishops that care more about speaking the truth than being popular( which is a sin!). May God bless this holy Bishop and encourage more Bishops to speak out.